Helen Sharpe, Jennifer Spence and Jennifer Cruickshanks in Liverpool as Fife AC – also including Steph Pennycook – won passports to Portugal! 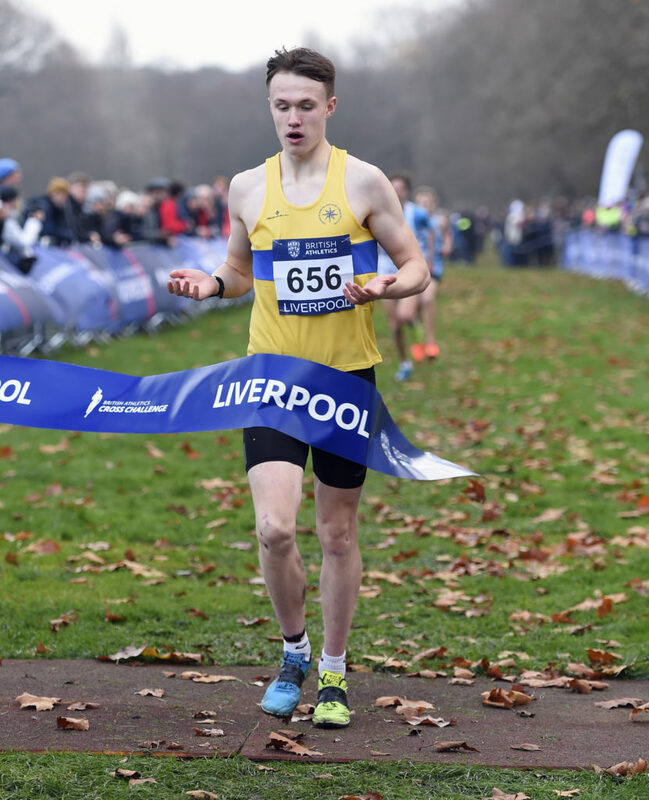 Magnificent Fife AC will represent UK Athletics in Europe early next year after confirmation that Scottish outfit won their European Clubs XC Champs trial at Liverpool yesterday. 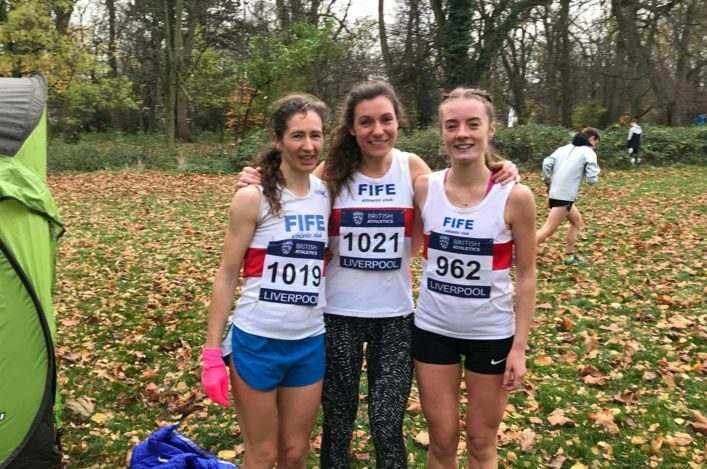 It’s tremendous news for club athletics in Scotland from a British Cross Challenge event on Merseyside which saw Anna Macfadyen claim an automatic place with the GB and NI team for the Euro Cross event in Holland next month. 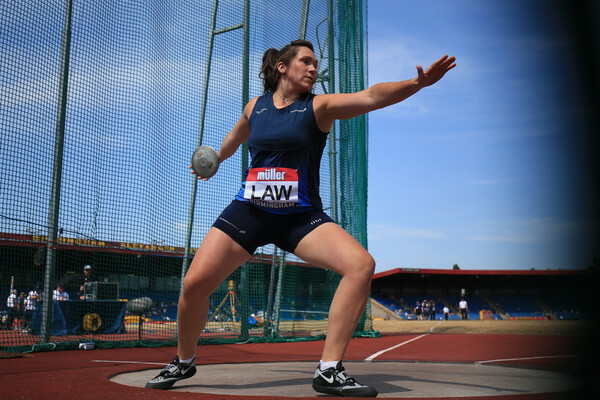 The Fife AC team of Steph Pennycook, Jennifer Spence, Jennifer Cruickshanks and Helen Sharpe saw off the challenge of English and Welsh representatives Tonbridge and Swansea and now will head to Portugal in February! It is understood it is only the second time this century a Scottish club has reached the Euro Clubs XC finals with Central AC men having been involved a few years ago. 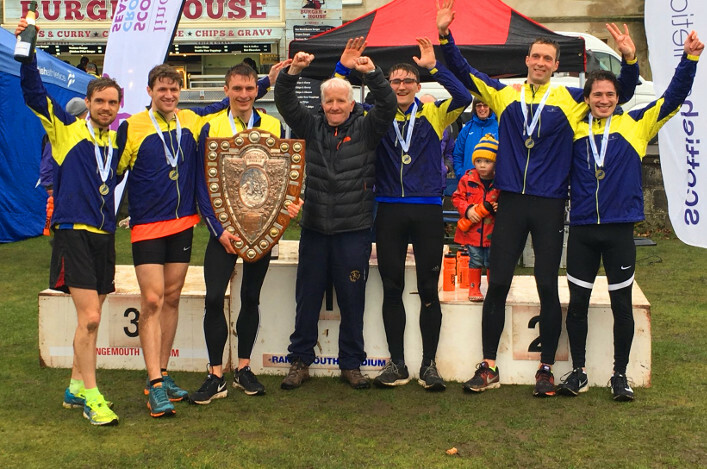 Well done from all at scottishathletics to the athletes and coaches at Fife AC, led by Ron Morrison and team manager at Sefton Park, Roger Rees, on a really fine achievement and another very positive outcome for our sport. The event is being held on February 3 next year in Albufeira, Portugal, with a host of clubs from around the continent currently going through a trials or qualification process. Anna Macfadyen is also headed into Europe after winning an individual place in the GB and NI team for the Euro Cross next month at U20 level. The Forres Harriers/Edinburgh Uni Hare and Hounds athlete came home in fifth place and inside the automatic selection for the event in Tilburg in Holland on Sunday 9 December. 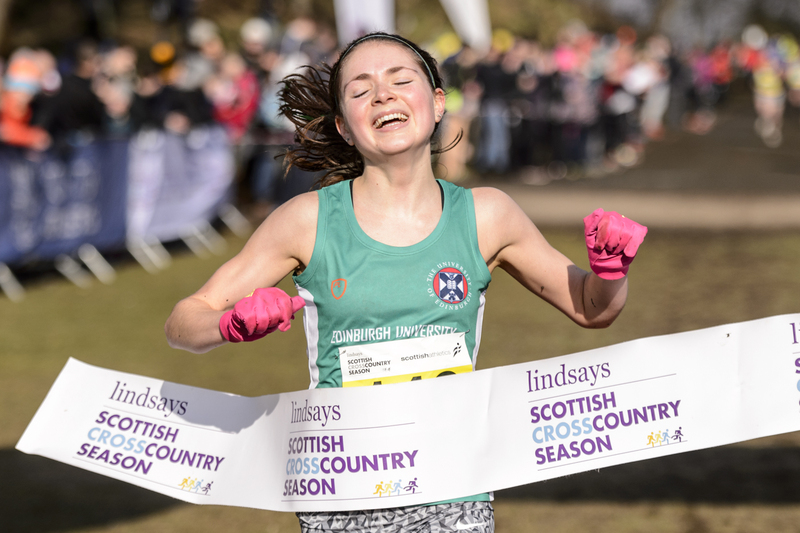 It was another fine performance by Anna who won silver medal at the European Mountain Running Champs in the summer in a year which also saw her take the Lindsays National XC U20 title at Falkirk back in February. Anna has previously been to a World Cross with GB in 2017 so continues to amass great experience in both hill running and cross country. Anna was the sole Scot to secure a team place for the Euro Cross with other contenders falling just short of the selection requirements despite having good runs on the day at Sefton Park. Adam Craig and Mhairi Maclennan would come into that bracket with both in the top ten in the Senior categories for Men and Women as they wore Scotland vests. Inverclyde athlete Craig was 13th overall with his club-mate, Andy Douglas, the next best Scot at 22nd after a solid run. Mhairi was ninth overall with Steph Pennycook at 13th to help that Fife AC team effort. Kilbarchan AAC athlete Cameron Wright had a superb run to finish in eighth place in the U20 race and while that means he misses out on the Euro Cross it could be that he is now very much in the mix for a GB and NI vest at the Great Stirling International XC in January (when the U20 age group changes). Freddie Carcas in ninth and Joe Arthur (12th) gave Edinburgh AC two creditable finishes in Scotland vests. Further down the age categories, it was a good day for a number of individual Scots as a whole host of clubs were represented on Merseyside. 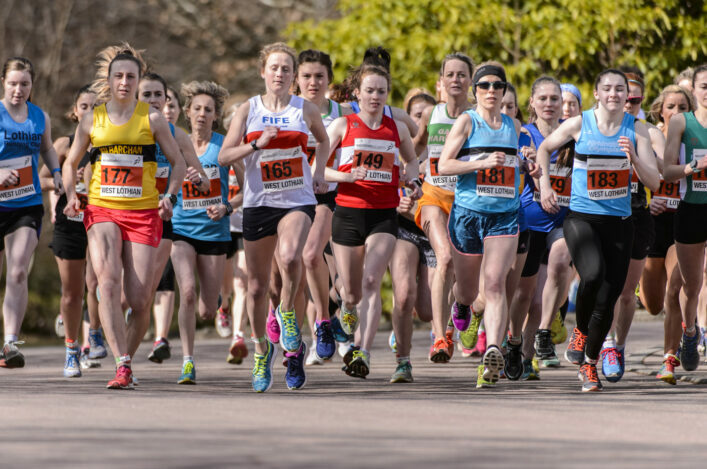 Hamish Armitt of Giffnock North AC took an impressive win in the U17 Men’s race and Cera Gemmell of Team East Lothian was second in the U17 Women’s race with both those athletes looking to place high in the British Cross Challenge rankings. There was a strong Scottish presence in the U15 Girls race as Anna Hedley of Fife AC took second place with Valencia Wright of Giffnock North coming home in fifth. In the U15 Boys race, there was a fifth place for Gregor Campbell of Shettleston. And, at U13 level, Fife AC’s day was complete with a race win there for Isla Thoms, one of their Lindsays National XC Relays gold medallists from Cumbernauld. In the U13 boys race, there was a fourth place for Fergus Currie of Garscube Harriers.